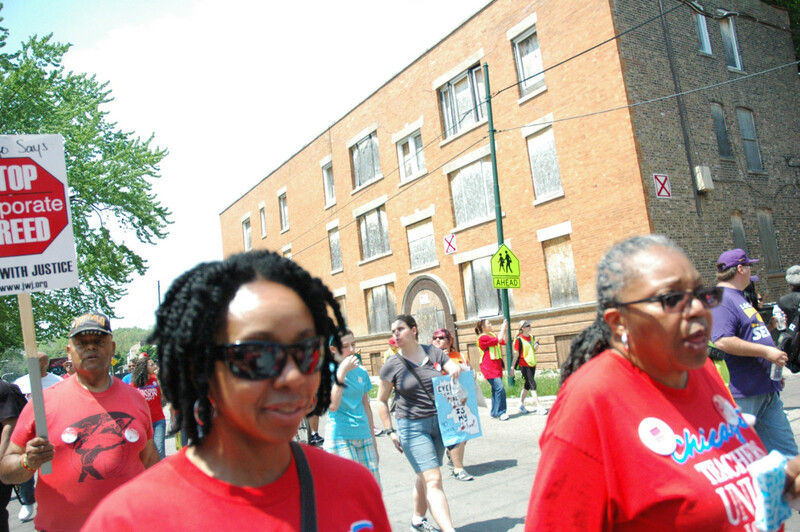 Teachers and CTU supporters march past boarded-up apartments designated for demolition on the southside of Chicago. As previously stated in A Just Chicago, the CHA has been sitting on hundreds of millions of dollars in cash reserves. On Wednesday, July 8 the secretary of the federal Housing and Urban Development (HUD) office reiterated this fact at a ribbon cutting ceremony at the former site of the Stateway Gardens public housing development, now re-christened as a mixed-income development called Park Boulevard. HUD estimates that the CHA is sitting on $440 million and wants to know what Mayor Emanuel’s plans are for using it. There are nearly 300,000 families on the CHA waitlist. Only 7% of the new units in the Park Boulevard development are “affordable,” and 8% are public housing. That’s 71 out of 475 units available to a family of four earning at most $45,600 annually. Median household income for census tracts 3515 and 3805. Median family income for the two census tracts for Park Boulevard was only about $32,000 in 2013. Affordable housing is defined as rent or mortgage not surpassing 30% of household income. Almost 70% of residents would qualify for affordable housing in the new Park Boulevard development yet only 15% of the units are designated as such. Thus, it is apparent that the city is continuing in its endeavor to push out low-income families and use federal subsidies to build housing in the private market for middle-class and wealthy residents. The CHA is sitting on a huge pile of money that is causing concern for the federal government, yet there are still no details on how the city plans to use the money to build much-needed affordable housing. community development, disinvestment, poverty, privatization. Bookmark.